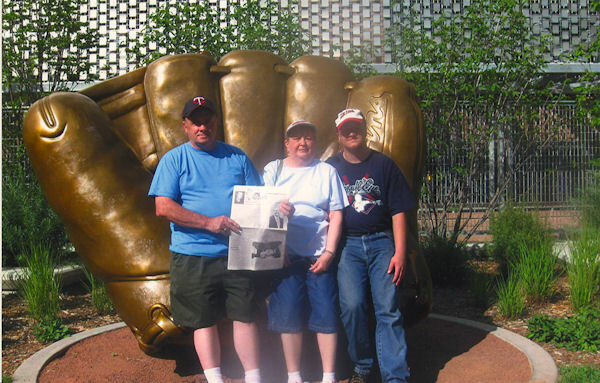 Milton and Janet Keever of Oquawka, took "The Quill" along to the Minnesota Twins new baseball stadium "Target Field" in Minneapolis, MN while visiting relatives. They are sitting near the stadium in Target Plaza on a bronze baseball glove, a symbol of the annual Gold Glove AWARD with their nephew Bradley. "Target Field" features one of the closest seating bowls to the playing field in all of Major League Baseball. They witnessed a game between the Minnesota Twins and the Chicago White Sox.